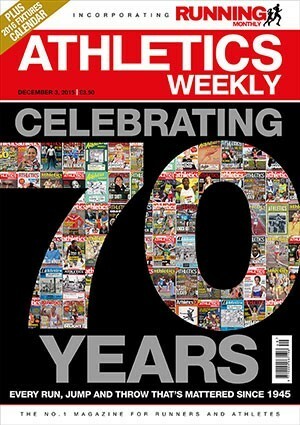 Athletics Weekly celebrates 70 years of the publication this month and we marked the milestone with a special celebratory edition on December 3. Features inside include a look at the founding of AW, the development of the publication over the years and an article highlighting when we first mentioned some of the stars of the sport in our pages. 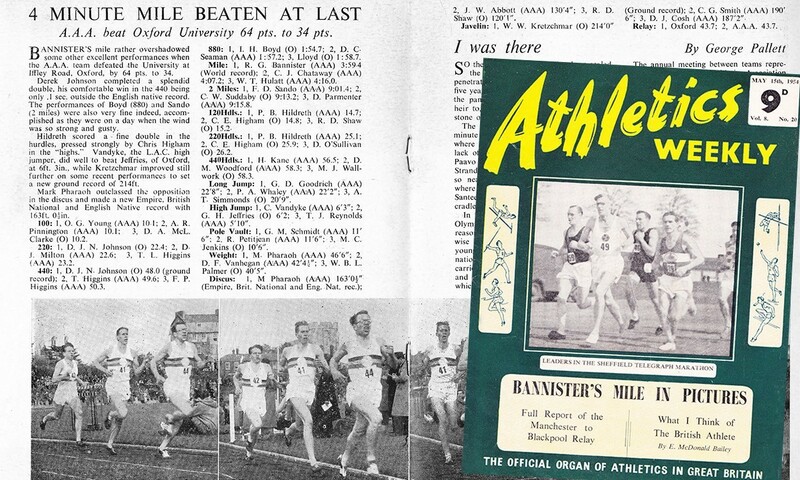 Roger Bannister created history when he clocked 3:59.4 at Iffley Road on May 6, 1954. Helped by his training partners and pacemakers Chris Brasher and Chataway, Bannister scaled the Everest of athletics with a performance that is often described as the most significant athletics achievement of modern times. 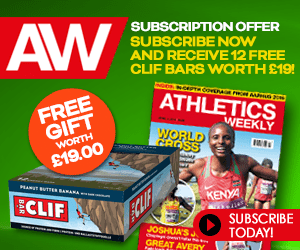 AW’s original report appeared in the May 15 issue in 1954 and was written by George Pallett, a British long jump international and athletics writer who died in 1996 aged 88. Widely regarded as perhaps the most thrilling footrace on British soil, Chris Chataway outsprinted Vladimir Kuts in front of a huge audience at the White City over 5000m in October 1954. It earned Chataway, who had been a mere pacemaker for Roger Bannister in the first sub-four-minute mile a few months earlier, the BBC Sports Personality of the Year award. Chataway’s time was a world record of 13:51.6 but it was the nail-biting victory in this London v Moscow match that captured everyone’s imagination. 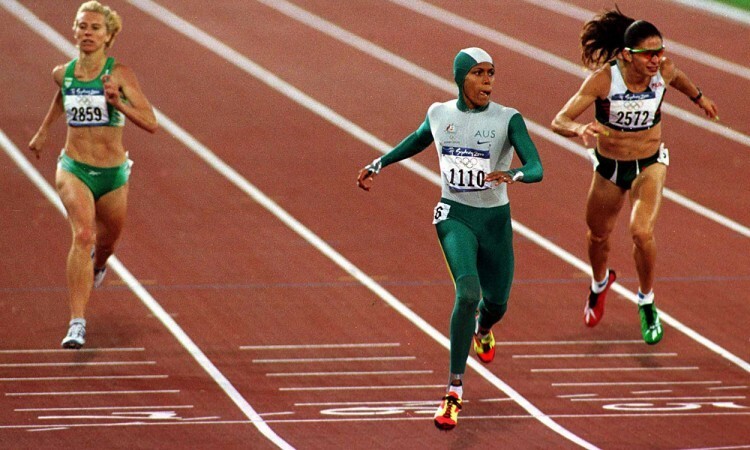 The Olympic icon of the 2000 Games, Cathy Freeman lit the cauldron and then won her 400m race in style in front of a packed home crowd of more than 110,000 spectators on a night that was later dubbed ‘Magic Monday’. The session fell bang on AW’s deadline and the four-man reporting team in Sydney, led by editor Jason Henderson and photographer Mark Shearman, rattled out reports from Freeman’s 400m final, the Haile Gebrselassie v Paul Tergat 10,000m battle, Jonathan Edwards’ triple jump victory and Kelly Holmes’ 800m bronze medal-winning performance within minutes of each event finishing so that the design and production team back in the UK could lay the words and pictures out on the pages. AW’s report began: “Forget about Sydney flu. Anyone entering Australia before these Games couldn’t avoid being bitten by a much stronger bug: Freeman fever. Mike Powell’s win over Carl Lewis in the long jump at the 1991 IAAF World Championships is widely regarded as the greatest field events contest in history. 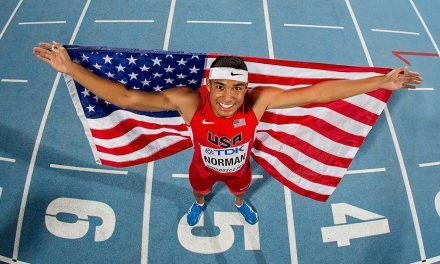 Both athletes jumped further than Bob Beamon’s 23-year-old world record and Powell’s 8.95m set at these World Championships in Tokyo still stands as the world record today. 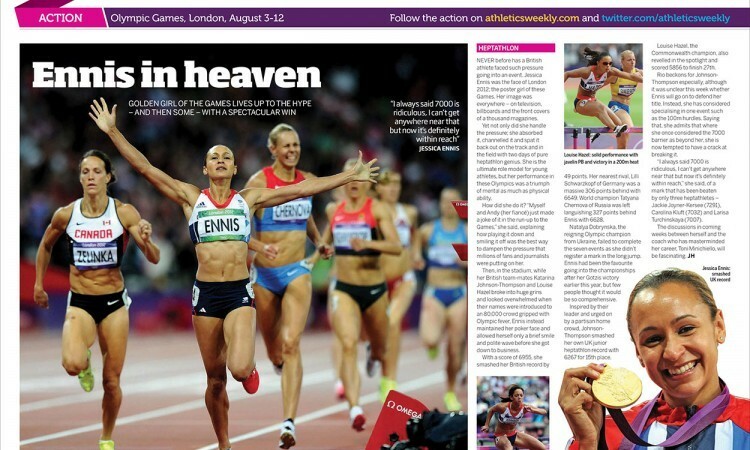 AW’s front cover at the time featured world 10,000m champion Liz McColgan with the headline at the side “Leap year – Mike Powell breaks Bob Beamon’s long jump world record”. But a few issues later Powell got his deserved place on the AW cover. Writing for AW in Tokyo, James O’Brien said “it was the most remarkable long jump competition of all time, one in which the defending champion produced his finest series of his career yet still had to settle for the silver medal”. Elsewhere, AW described the event as “a monumental slice of track and field history”. In Sydney in 2000 we had Magic Monday, but the Super Saturday in 2012 arguably surpassed it mainly due to the massive success from the home nation. 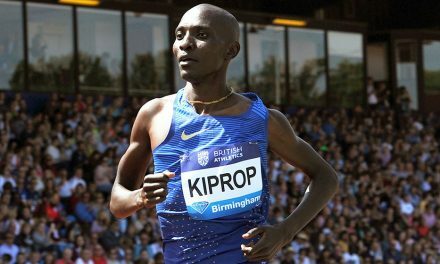 The crowd in the London Olympic Stadium saw victories from Jessica Ennis in the heptathlon, Greg Rutherford in the long jump and Mo Farah in the 10,000m on a dazzling night charged with emotion and atmosphere. AW’s coverage from major championships is usually split over two issues. 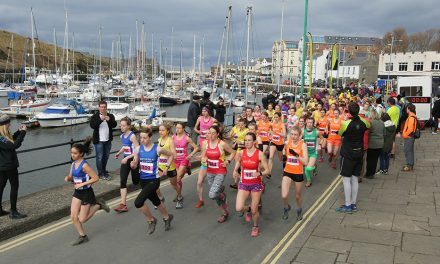 The first issue takes in the opening weekend, which traditionally involves the blue riband 100 metres and events like the heptathlon. Then, our second issue, covers the last half of the championships. Super Saturday was on the opening weekend in London and our cover featured images of the three British gold medallists plus Usain Bolt with the mini-headline “lightning really does strike twice”. All of these athletes had been featured in AW many years earlier. For example Rutherford was in our pages being soundly beaten in the English Schools championships as a young boy, while Bolt was featured – with an image – winning the world junior title in 2002. Here, in London, they were all on top form and AW called Super Saturday “the greatest night in British athletics, probably even in British sport”. Mary Decker’s tangle with Zola Budd in the Olympic 3000m final at the 1984 Los Angeles Games is one of the most controversial moments in sporting history and is still debated today. 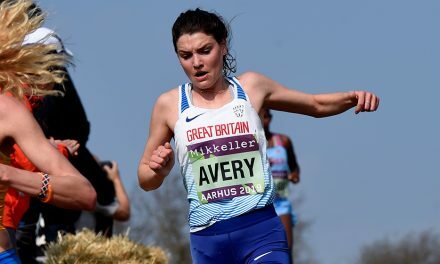 America’s reigning world champion was pitted against a barefoot teenage prodigy from South Africa who had been swiftly given a British passport on the eve of the Games, but Decker ended up on the in-field after tripping and Budd was booed home in seventh place as Maricica Puica of Romania took gold from Britain’s Wendy Sly. 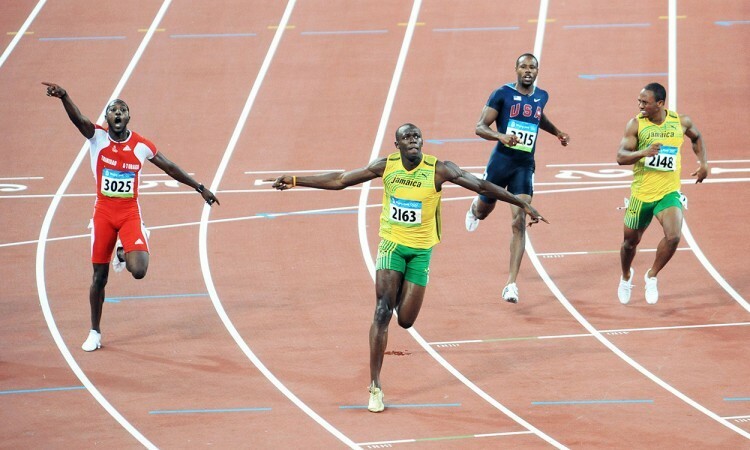 Usain Bolt would later run faster in the IAAF World Championships in Berlin, but the Beijing Olympics in 2008 is where the Jamaican first truly made a name for himself with victories and world records in the 100m, 200m and 4x100m. 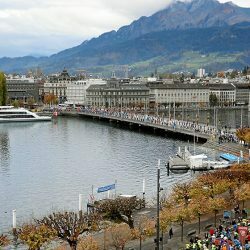 “Until this month,” AW’s report began at the conclusion of the 2008 Games, “Beijing was best known for Tiananmen Square, the Forbidden City and its famous crispy duck. Now, it will be associated forever with the iconic Bird’s Nest stadium and the sporting exploits of Usain Bolt. The men’s 100m sprint in Seoul has been called ‘the dirtiest race in history’ and was dominated by Ben Johnson, who broke the world record and subsequently tested positive for steroids. “Johnson disgrace” was the headline emblazoned on the front of AW’s September 30 issue that year, while inside the magazine the pages were full of smaller headlines like “Fall of a champion” and “Countdown to a crisis” as the whole sorry story was chronicled in our pages. 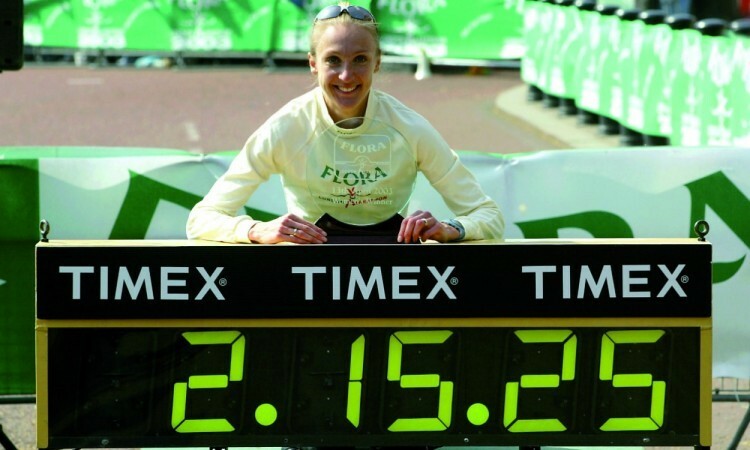 Paula Radcliffe’s 2:15:25 world record for 26.2 miles in London in 2003 has not been remotely challenged in the last dozen years and is one of the strongest records in the book, if not the best. 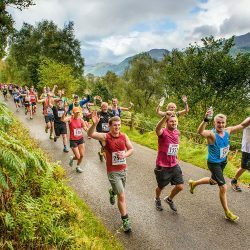 When she did it, the Bedford athlete topped the UK rankings for the year – ahead of the entire British male population, let alone women. 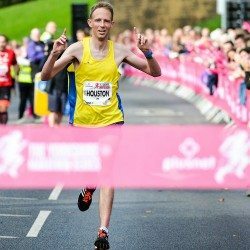 He added: “Paula ran some parts of her marathon at sub-five- minute mile pace. 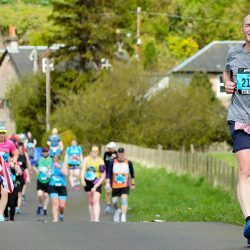 Yet only half a century ago women found it impossible to break five minutes for a mile and it was not until 1954 that Britain’s Diane Leather became the first female to break the barrier. Such was the success of AW’s coverage of the careers of Seb Coe and Steve Ovett, a spin-off book was published entitled The Coe & Ovett File and it consisted entirely of clippings from this magazine’s coverage. The highlight was Moscow in 1980 where Ovett famously won the 800m before Coe got revenge in the 1500m. 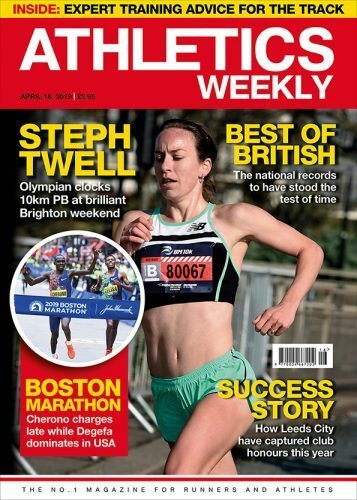 AW editor Mel Watman did not mince his words either, writing after the 800m: “Steve Ovett ran so physical a race that he can consider himself lucky not to have been disqualified, while Seb Coe chose an Olympic final of all occasions to run the most abysmal race of his career.